Before Christmas, I came across two Fiesta finds (okay, steals) on ebay. One was a Riviera “Mexicana” platter that the seller had mismarked as Universal Potteries. (A quick lookup with Google confirmed that Universal Potteries never made ANYTHING that looked like Riviera.) The platters, whether solid or decaled like the one I bought, typically start at $25 and go up from there I was the lone bidder so I got it for the opening bid of $12.99. The other was a Kitchen Kraft cake plate for $0.99 that typically commands a $30 to $75 pricetag. The seller described it as “unmarked Fiesta plate,” but I knew what it was when I spotted the photo. I felt like the American Pickers, except I only had to tap a few keystrokes and know what I was looking at to unearth my treasures. At the opposite end of the spectrum, Mr. Official and I scouted out the Fiesta dish “outlet” on Sevierville Highway as we headed home from Gatlinburg several weeks ago. They had some nice vintage pieces, along with new factory seconds and (maybe) first quality items, which were overpriced. Shrug. We were in a tourist trap, so the markup was expected and it was still fun to look. 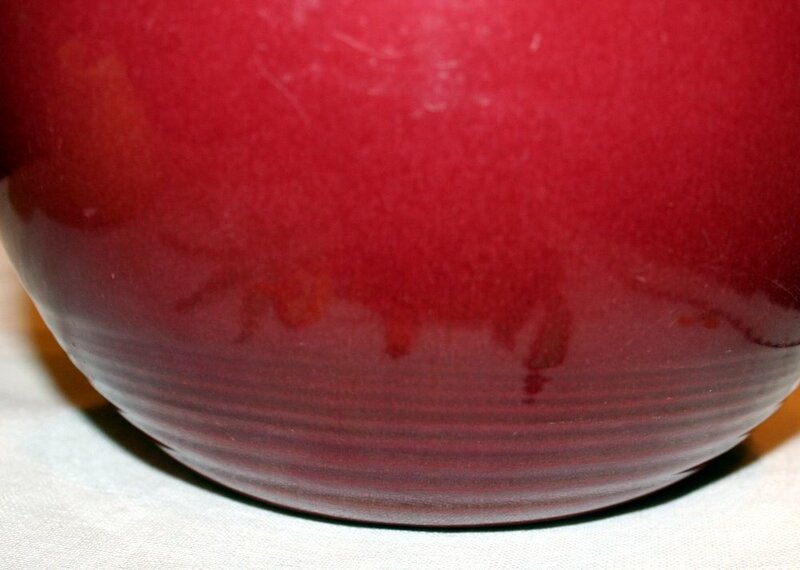 Among the vintage pieces was a stack of cream soup bowls they had tagged for $65 each. Which is about the going rate if you have pristine-quality pieces and a willing buyer. (I paid about $10 each for mine, and accepted a couple with chips in the mix.) But, here’s the kicker: they had marked them as onion soup bowls, which retail for about ten times that amount. 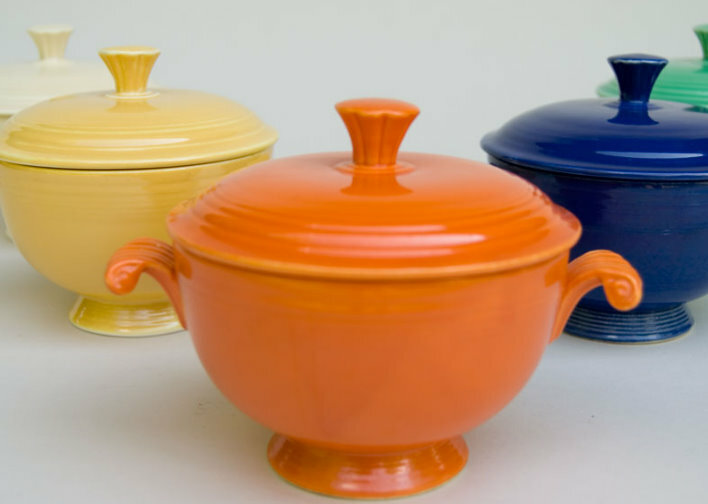 Let’s hope no unsuspecting buyer thinks they’re getting a steal based on the misleading tag, which could happen if you just know the Fiesta lore and know that onion soup bowls are exceedingly rare and expensive. I have collected things just because I liked them, and didn’t really care what they were called or what they were worth because I wasn’t spending much on any of them. I’ve found the more I learn about Fiesta, the more I appreciate the pieces I come across. 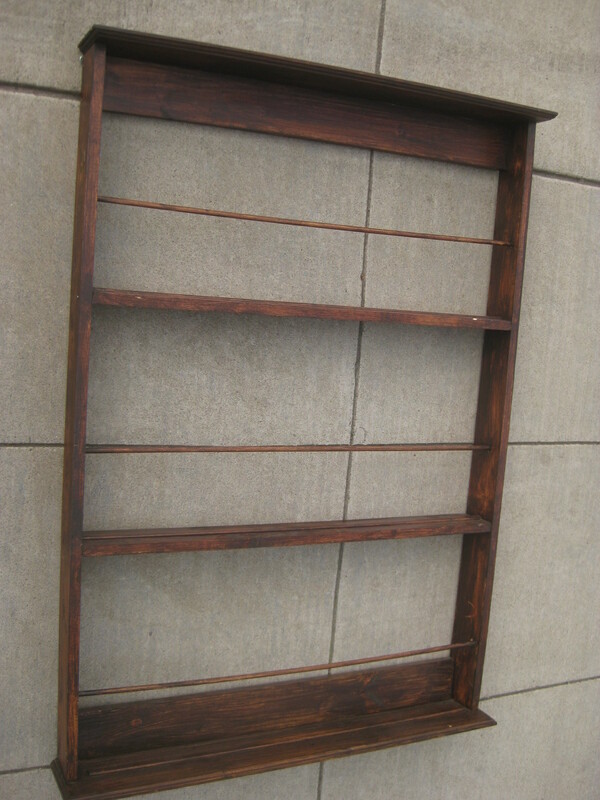 Sometimes I have the fun of unearthing a piece from the dark, dusty recesses of a salvage store. I wipe away layers of dirt and grime to see it is, then try to act nonchalant as I hand it to the cashier. Other times, I simply admire a gleaming, beautiful piece that is proudly displayed by someone who knows what they have, and what it’s worth. So what do you collect, and why do you love it? So I had the supplies, the creative spark, and the mental image of the finished piece. But right about then, the annual holiday tsunami hit, and my project stayed high and dry in the garage, until just a few days ago. The tools needed are your standard fare: router, a saw to cut the boards in half, and a drill to make pilot holes and screw in the screws. 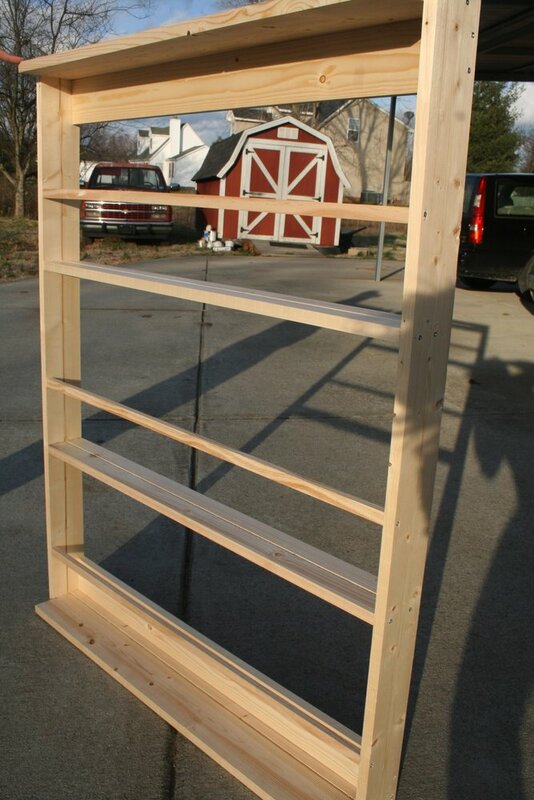 Once I (ahem, we) got started, it really was a very easy project. 1. Route grooves down the middle of one of the 1x4x6 boards and the same distance from one edge of the 1x6x6. 2. Cut all the boards in half. 3. Make sure everything was either 3 feet or 4 feet long. 4. Lay it out and assemble. 6. Wait for everything to dry. Tap, tap, tap. 6. Add hangers and hang. 7. Acquire platters to fill it up; the most time-consuming and expensive part! And the Edwardian hutch. The Christmas village is gone, but in its place is a mix of traditional and contemporary white pieces including an elephant for luck. Buying off eBay can be fun and exciting. And with some discipline, it can be a fairly (cough) inexpensive means of acquiring items that you want, especially those that are no longer readily available in stores. Like my Fiesta dishes. And my violet china. And my Christmas village pieces. But as the saying goes, occasionally, there’s a fly in the ointment. And this past year, I had two ointment incidents – and my guess is they were equally frustrating for the sellers. The first involved my “lucky #7 red bowl.” Well, it wasn’t so lucky. When the USPS driver handed the box to me, it rattled. I told him it shouldn’t rattle. We opened it then and there, to find shards and chips rattling around what was left of the cracked bowl. The seller graciously and promptly refunded my money, but that meant I was – and am – still short the seventh bowl. One of these days, another one in good quality at a good price will come up and I’ll snag it, but sometimes you’re ready for the hunt to be over, and I was at that point. More recently, the UPS driver left a box at my door that also rattled ominously when I picked it up. It was supposed to be the Granville house from “It’s a Wonderful Life.” Well, apparently UPS’ aim was better than George’s – they not only broke out a window, but busted up the whole place. All the kings horses and men couldn’t put this thing back together again. Like the Fiesta bowl, it’s disappointing for all concerned. In the big scheme of things, it’s a minor tempest in a tiny little teacup, but once again, I’m left without the item that I had really hoped to have and display. So why am I writing this? To vent, yes. 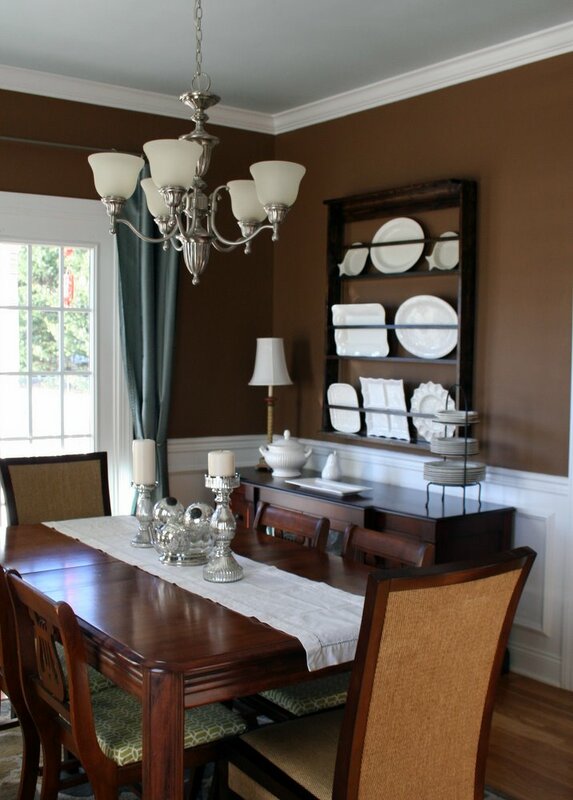 And to caution sellers of one-of-a-kind items to take extra precautions when preparing them for shipment. An extra layer or two of bubble wrap, snugged up nice and tight, can mean the difference between a successful transaction and one that leaves everyone feeling the pain. I’d lump in the drivers and package sorters into my little list of transgressors, but to be honest, those guys do a tremendous job, day in and day out. I can’t expect them to treat every package like they’re carrying afternoon tea to the Queen. And I guess I will make it a point from here on out to remind/plead for extra-careful packaging on any future eBay wins. Then cross my fingers that the box doesn’t make a clink when it shouldn’t. Several holidays ago, a miniature Christmas greenhouse caught my gardener’s eye. It was under $10 so I bought it. Next year, I found another one, so I did the same thing. And again, a year later. Then I realized I couldn’t buy a miniature greenhouse every year for the rest of my life, so I stopped. But I did buy a few extra pieces: a gazebo, an outhouse (I do have a particular fondness for them), and some snow shovels. For a few years, I displayed them every holiday in our dining room. New house, new resolve to get cracking on my Christmas decorating made me think of those greenhouses, and I made a mental note to get them out and display them. Over Thanksgiving, I got a wild hair to see if there were any new (or newer) greenhouses or something else outdoorsy – like a miniature Christmas tree lot or frozen pond. So I went on eBay to find out. The next thing I knew I had fallen down a virtual rabbit hole and was ogling and coveting entire miniature villages. Tidbit #2. In the last decade, there were entire Christmas villages created around two of my all-time favorite holiday movies, “It’s a Wonderful Life” and “The Christmas Story.” Everything from Higbee’s department store in Cleveland to Gower’s Drugstore in Bedford Falls, replete with figures of George and Mary Bailey and their friends and family, and of course Ralphie and his brother Randy and the infamous leg lamp. Most of those pieces are readily available on eBay. For collector’s prices, of course. I am going to be picky. I am not going to be a putz. Or a putz collector/hoarder. The only pieces I really, REALLY want are Ralphie’s house and school (Grover Cleveland Elementary) and the frozen flagpole from “The Christmas Story;” and the Granville house (remember the scene when Mary winds up in the hydrangea bush?) from “It’s a Wonderful Life.” And maybe a country house with a porch like ours. And that’s it, I promise. Not even another greenhouse, because I know my limitations. Okay, maybe a mailbox or a birdhouse or a frozen pond, too. And I’m even willing to bide my time until I get what I want at the price I am willing to pay. Even if it means not having it all in place for a few more Christmases. I think so, anyway. 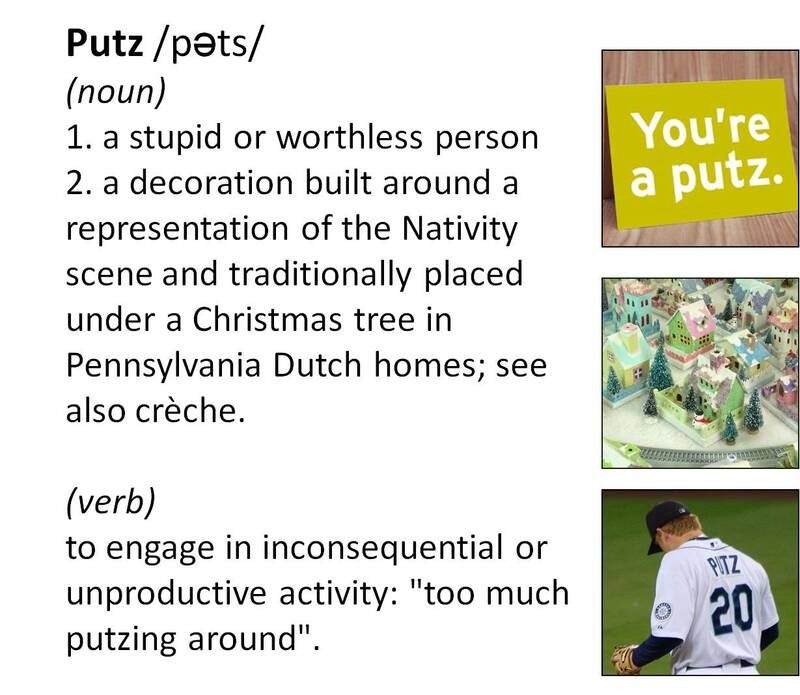 I’m not a putz and I’m not going to putz around with Christmas putz too much. After all, there are cards to mail, cookies to bake, lights to untangle, carols to sing…. My collection of obsession (?) with vintage and new Fiesta and bowls is well-known and chronicled. 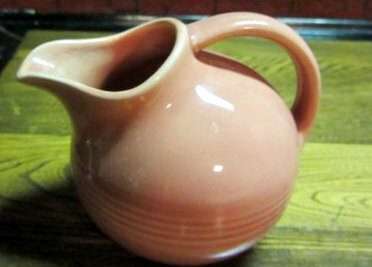 But a few recent jaunts to local antique stores started me in another direction: ball jugs, also known as tilt pitchers. These are easily recognized by their bulbous (err ball) shapes and tilting spouts. 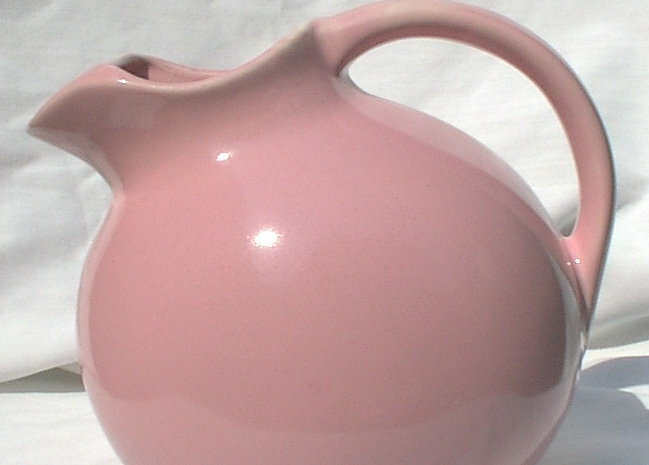 The large Harlequin jugs came in shades of maroon, rose and spruce as well as “atomic (uranium) red” and mauve (which is more blue than pink), yellow, turquoise and gray. Full retail rate for one in good to excellent condition is $80-$150, so if you find one without cracks or chips for less than that, you may have a good deal on your hands. 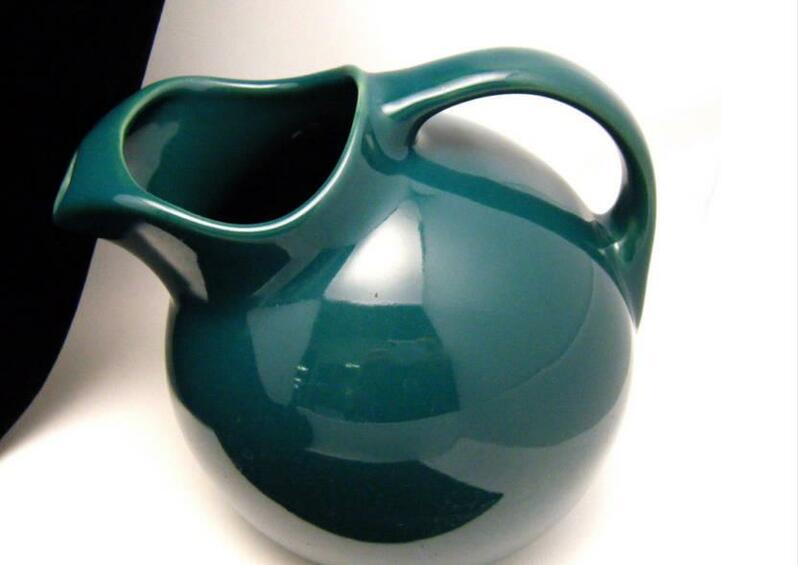 If you’re curious, here’s a small sampling of the ball jugs you may find in your forays, starting with spruce green. 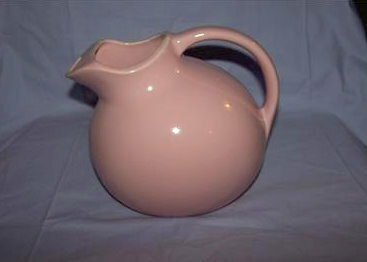 The pitcher on the left is the Harlequin full-size jug. 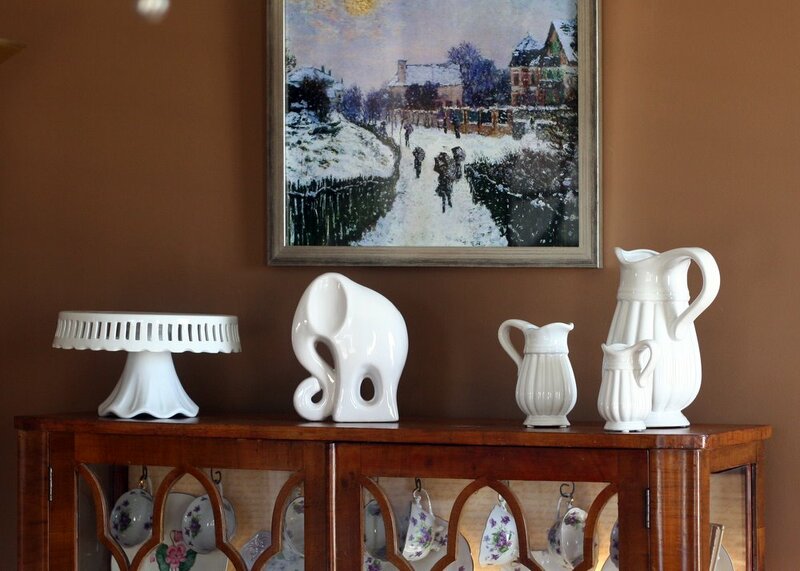 On the right is the Hall jug, also in spruce. Very similar in looks and price, but the concentric rings around the bottom third of the Harlequin jug (or lack of them) will help you differentiate between them. 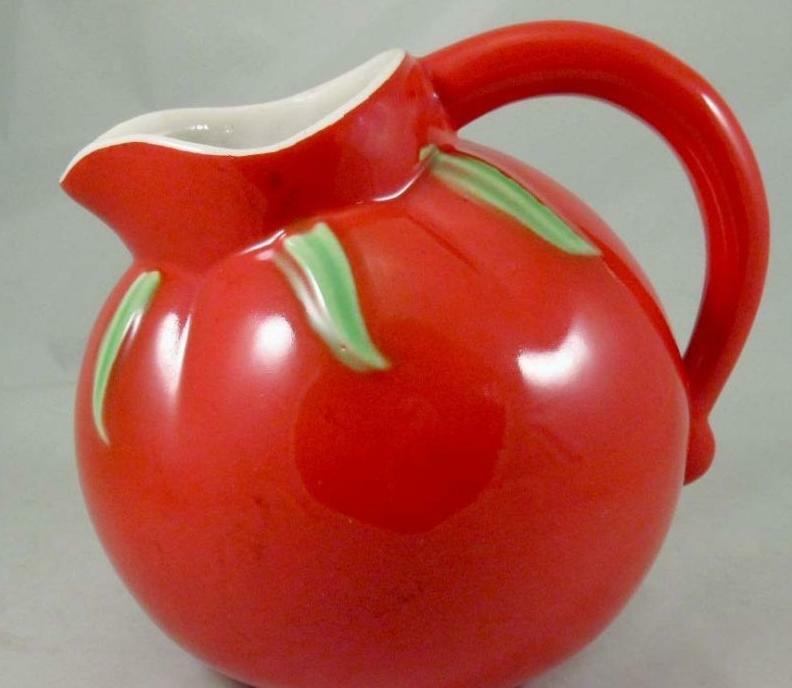 This piece is marked “Fiesta USA” but the stamp is not the genuine Homer Laughlin stamp and the handle is very different from the Harlequin ball jug’s handle. 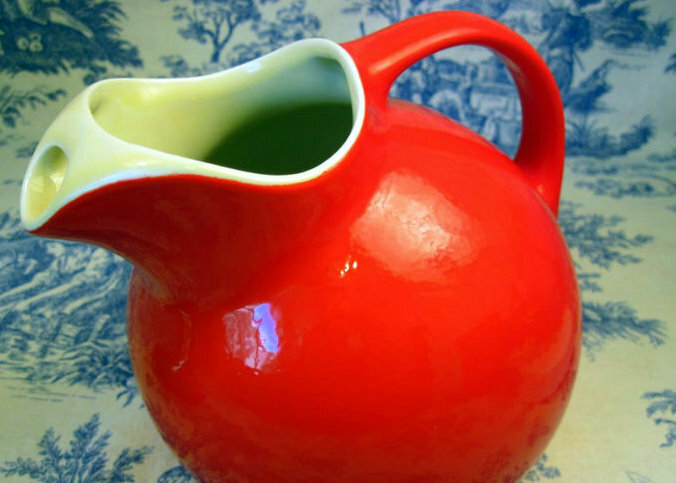 Here are some examples of the red jugs commonly found online and in antique stores. 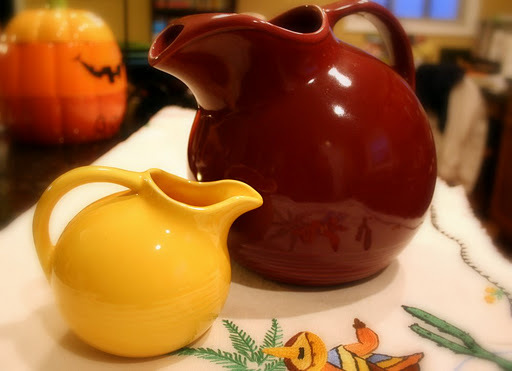 On the left is a Harlequin in “Atomic Red”, and on the right is Cronin’s (sometimes sold as “Sevilla”) small creamer; Cronin also made a full-size version, with the same interior. 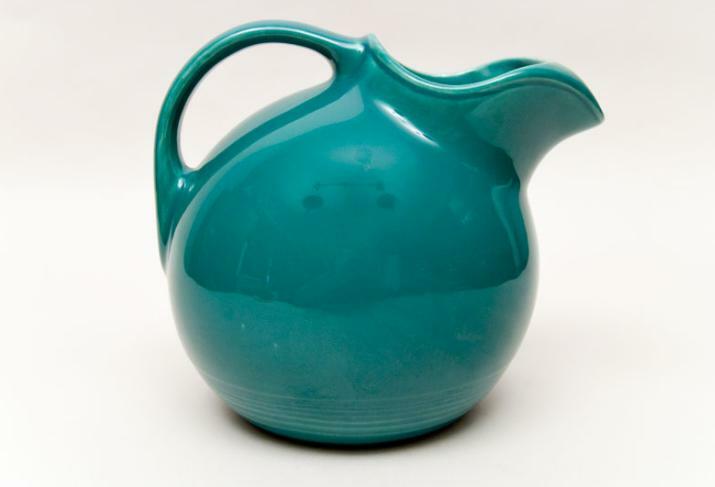 (However, I’ve also seen at least a cobalt blue Cronin pitcher that was blue on the inside as well. Know your markings! 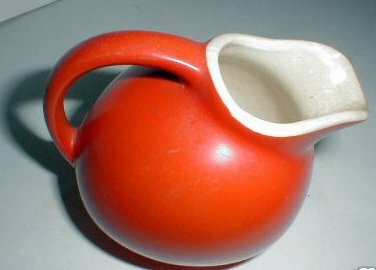 On the left is a Redwing Rumrill jug with a red-glazed spout and white interior; On the right is the Hall pitcher in “Chinese Red” which often commands a high price – note the white spout AND interior. 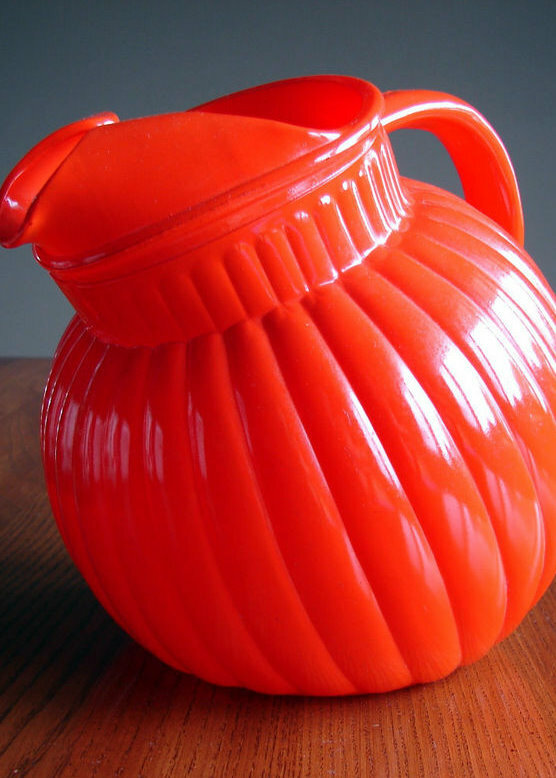 For fun, here are a couple of red ball pitchers that would never be mistaken for Fiesta or Harlequin, but are cute and retro in their own right; they would fit in with the bright pottery of mid 20th century. On the left is a ribbed jug which is not pottery, but fired-on glass. 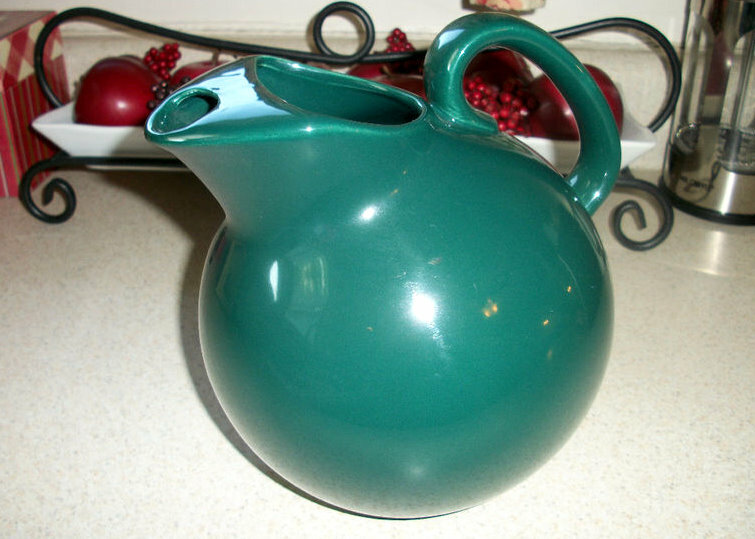 It was a popular promotional pitcher offered through Kix cereal, produced by Hazel-Atlas in various colors (there are matching tumblers, too.) Occasionally a light green version will be labeled as Jadite, but if you’re a Jadite collector, you should already know your prices, manufacturers and styles before you get too excited; as far as I know, Hazel-Atlas never made Jadite. There are other colors in Harlequin, but for brevity, we’ll end with pretty in pink. 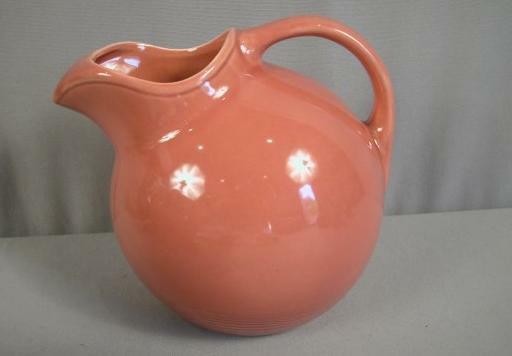 Harlequin called this color rose, but the full-size pitcher on the left appears almost salmon, at least in the photo. A smaller creamer-size pictures shows the concentric rings, which immediately differentiate it from other manufacturers’ pieces. 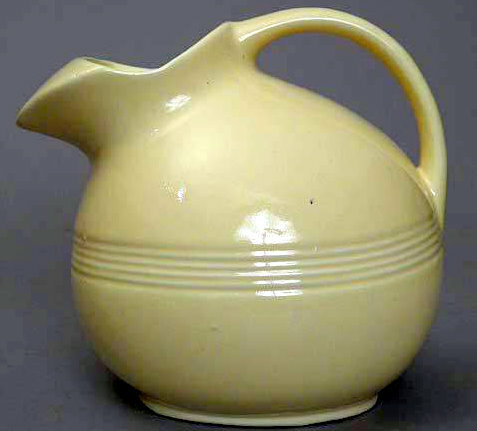 If you’re trying to distinguish between these two, the Taylor jug will be marked with USA in capital letters, while a McCoy jug will have a distinctive M or Mc mark. So there’s a quick overview of just some of the American ball jugs and tilt pitchers out there. 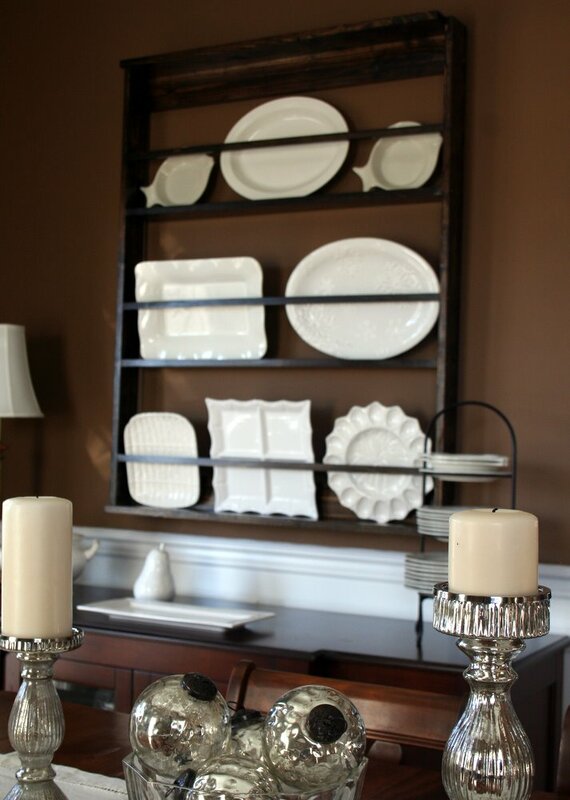 There were and are other manufacturers but these represent the most similar and pieces widely available in thrift and antique stores and online. 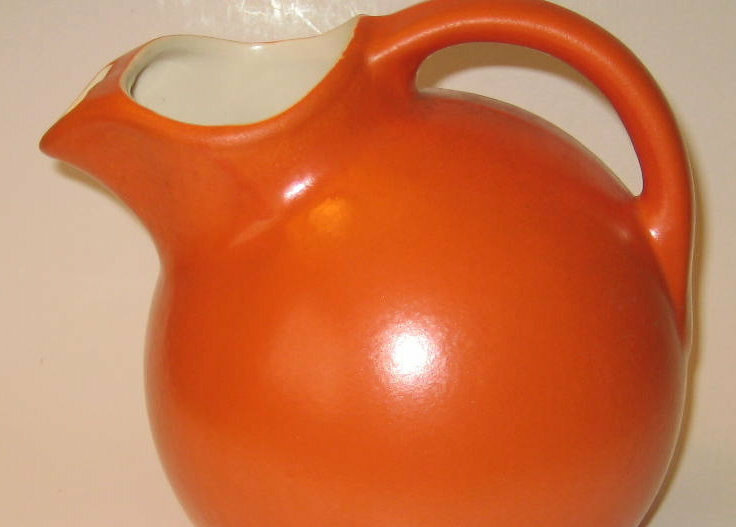 All of these jugs are bold, highly stylized and iconic pieces. 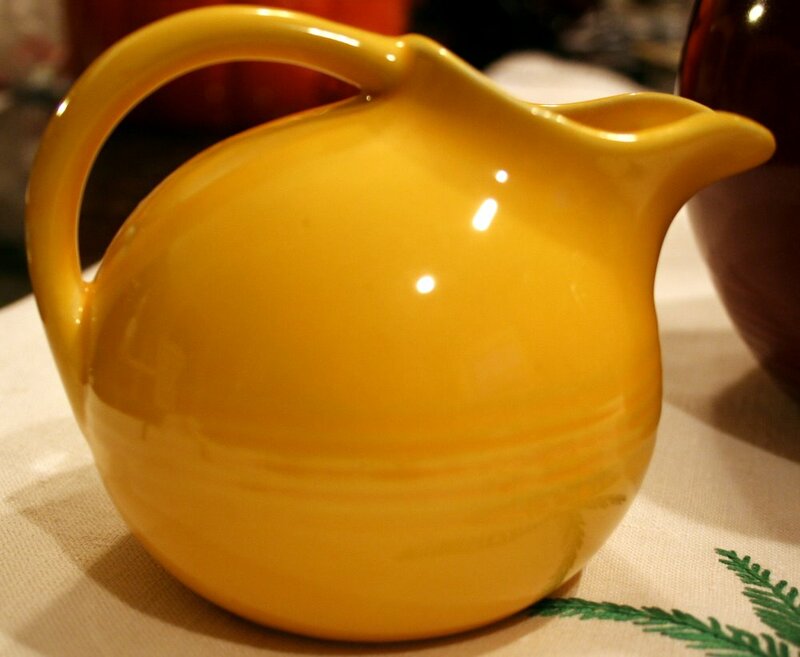 They speak of an era where beverages required a container (there were no plastic milk jugs or cartons) and sensibilities demanded the pitchers should coordinate with the table service. 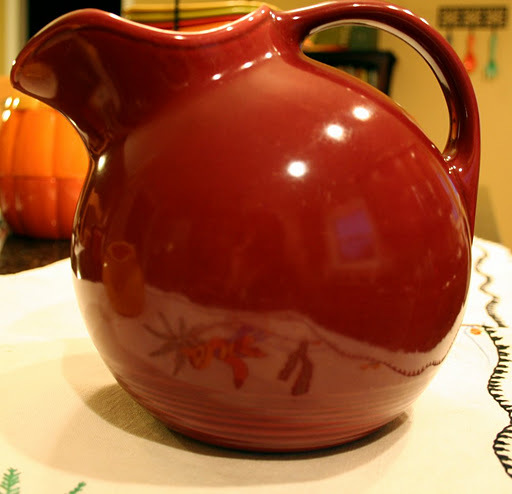 The jugs are great for using or displaying; the smaller jugs benefit from an eye-level display so they can be seen up close. They are all great collector’s pieces, but as with any vintage or antique items if you’re limiting your collection to one brand, it’s wise to familiarize yourself with exactly what you’re looking for (size, colors, etc.) and the typical prices for those pieces so you will know what’s a good deal and what isn’t. The bowl that started it all. It all started innocently enough. 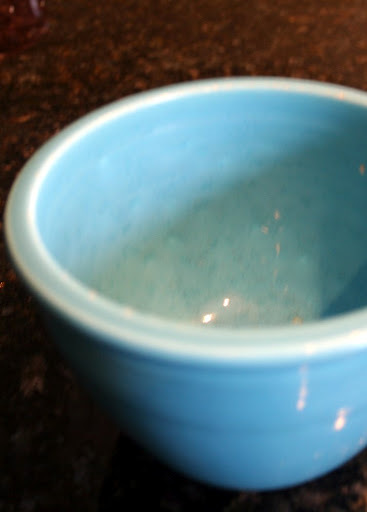 On one of my many antique/junk store forays (back before eBay dragged everything right to the virtual doorstep of my metaphorical “cave”), I was looking for Fiesta pieces and came across a small turquoise mixing bowl. I had no idea of its significance, I just knew I liked it. It–like many pieces of Fiesta you might find gathering dust in the back of an antique store–was not in perfect condition – it had a a few chips and dings. But I thought it would look nice with the rest of my pieces and it was just a few bucks. For several years, it remained my only bowl. Until I came across another one. It was an epiphany of sorts. And it started me on an odyssey that has spanned more than a decade. Piece by piece, bowl by bowl, I’ve slowly accumulated bowls along with an appreciation and familiarity with the shapes and sizes in the Fiesta and Kitchen Kraft line. 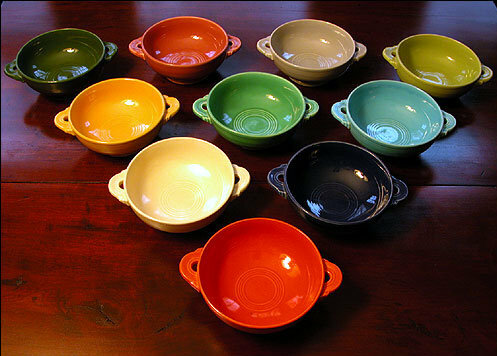 In case you’re curious, the Kitchen Kraft line has a trio of bowls, and there are seven bowls in the Fiesta set. 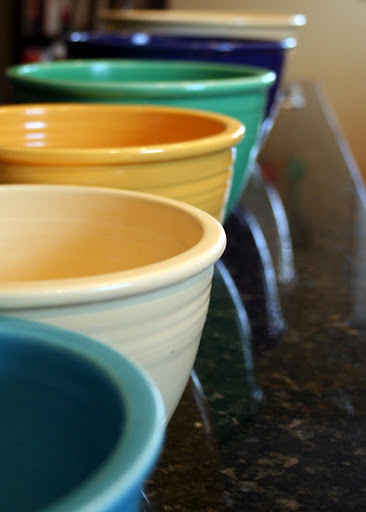 The bowl prices range from $10-$25 for smaller or banged-up bowls with chipped rims or large cracks, to several hundred for bowls in good to perfect condition. A set of seven nesting bowls commands a price of $1000 on eBay these days. (That’s what they ask for them; I have no idea who buys them for that price.) 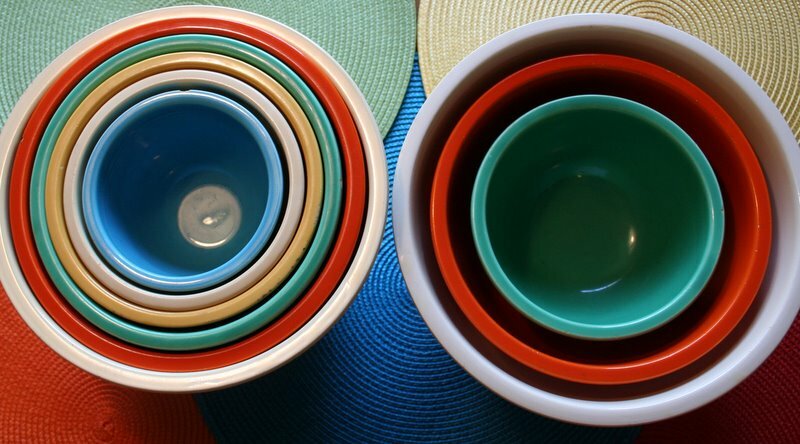 If you find bowls with lids, the price goes into the stratosphere – a single bowl with matching lid can go for $1000 or more. Crazy, huh? 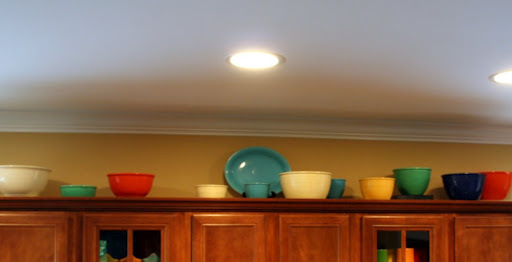 For the past few years, I have enjoyed displaying a full set of three Kitchen Kraft bowls, and all but the largest Fiesta bowl proudly in my kitchen. That bowl (known as #7) is relatively rare and therefore relatively expensive. Kitchen Kraft bowls on the left; Fiesta on the right. Yes I have 8 of them; 2 are duplicates. I limited myself to paying no more than $50 for any single bowl, which placed most of the large bowls firmly out of range. 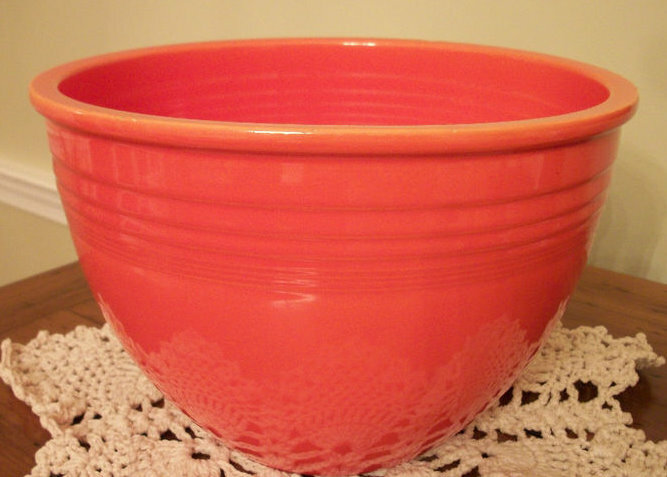 And so you can imagine my surprise and delight when I saw this red #7 bowl for $50 a few days ago. Lucky #7, I can’t wait to see you in person! I had to go up to $56 to win it, but it’s on its way to me and will complete my set. 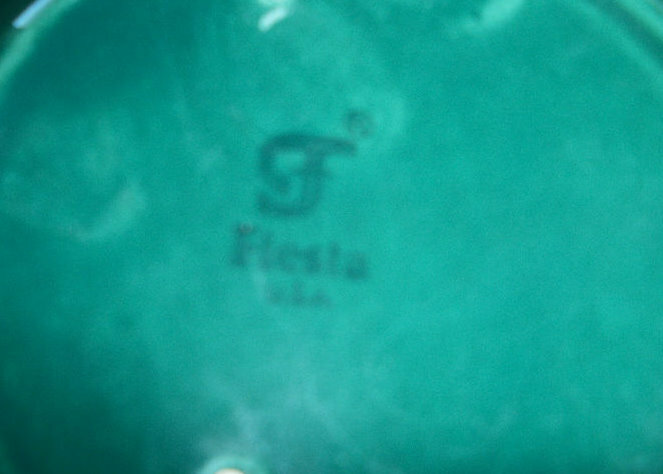 Of course, there ARE other Fiesta and Homer Laughlin bowls to collect…stay tuned! Just when I thought I was safe from the eBay collecting bug, it seems I may have been bit again. I recently discovered (have I been living in a cave????) that Homer Laughlin Company made not only Fiesta, Riviera, Harlequin and Kitchen Kraft, but they launched a line of Kitchen Kraft called “Oven Serve” back in the late ’30s. Actually that part I already knew – one of my Kitchen Kraft bowls along with my serving spoon, salad fork and cake server are part of this line (whether they are Kitchen Kraft or Oven Serve, I’m not sure.) But what I didn’t know was that this line featured so many pieces with raised embossed designs. In five graduated sizes, from 5 inches to 9 inches. Each with gorgeous glazing and texture. In yummy hues of turquoise and creamy ivory and green and melon yellow. Original advertisement – wish I could get them for $2.50 now! If you guessed it’s going to result in a quest for another set of bowls, that’s my guess, too. I just need to figure out where I can lay my hands on some without paying a king’s ransom for them. They are occasionally offered on eBay and Etsy.com, but not nearly as plentifully as my Kitchen Kraft and Fiesta bowls. But I will wait and watch, until I snag a set, all at once, or one-at-a-time. 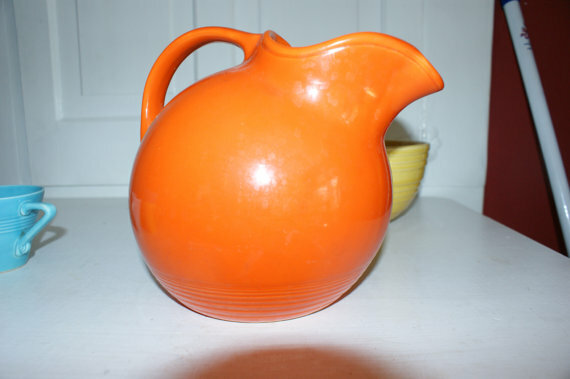 When I was researching these, I found the official name for this design is/was “Appletree.” Somewhere along the line, collectors began referring to them as “orange tree” or “orangetree” as well as Appletree. To further confuse things, a very similar pattern from Japan was also available during the time period when these were sold new. But who copied whom is apparently up for debate. We ARE going to need a bigger house, just so I’ll have enough cabinet space to show off all my bowls. Not that that’s a reason to move or anything. P.S., My fondness for Homer Laughlin and violets converged recently. I specifically sought out violet-strewn pieces of their “Debutante,” “French (or Pink) Violets,” and “American Beauty” dishes to include in my new violet-themed dish collection…which continues to grow, although at a sedate pace, now that the initial efforts are over. Now to find some of their “Eggshell Georgian” violet pieces…a few teacups or a serving bowl; that would be the bees’ knees. Given the number of violet china patterns they produced, apparently the fine folks and HLCO love violets almost as much as I do – another reason I ♥ them.